VOTE: Daytime Emmy Poll – Who Do You Want To Win Lead Actress? 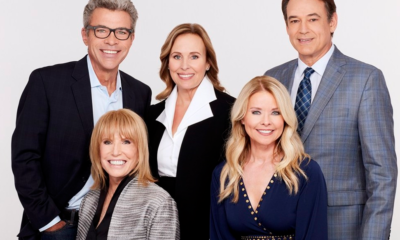 While you have heard from many pundits, and we have given you our On-Air On-Soaps picks for the Daytime Emmys on our predictions page, it’s time for you, our loyal soapers, to get a chance to cast your vote for which actress you want to see win tomorrow! So, if you were a blue-ribbon panel judge, who would you choose from the worthy five nominees? So after the jump, check out our Lead Actress Daytime Emmy Poll. You can only cast one vote from one IP address, so make it count! The balloting will continue this afternoon through to Saturday morning, June 23rd at 10AM PST time. So before we head out to the red carpet, we will let you know who the general consensus has chosen as the actress they would most like to see win the gold! And if you feel inclined, let us know why you voted how you did in our comments section below! Top Five Classic Daytime Emmy Moments! – From Lucci to Benard to Zimmer to Rosie! Ericka Slezak, I want her to get her lucky 7 win, Shes my favorite. I want her to do it for her, for the fans, and for One life to live, Shes my favorite and the best actress in daytime, And I miss Victoria Lord Bucannan. For sentimental reasons I’d like Erika to win, since OLTL is gone, but I want Days to win in all categories they are nominated in so I’ll be happy if Crystal wins. LAURA WRIGHT ALL THE WAY!!! There is NOT a better actress in Daytime!!! She makes you feel every emotion she is having, she has chemistry with eveyone. I have to agree. She’s fun to watch… she effortlessly, “acts”. she has more than come in to her own…. I swear.. I don’t know what it is about becoming, a mother… she has, stated as much… that, since the birth of her child(s)… she just radiates, on screen. She’s on fire. HOT. I am torn..Really love LW. (KINDA MAD SHE WAS ON THE CHEW THOUGH) she is still one of my favs..However I would love ES to win..I really miss OLTL..
Agree, girl. LW should NOT have done the Chew & Erika Slezak deserves this for Pete’s sake. LW can get it nex year. My life is not the same without OLTL. gloria, I agree, My life is not the same since One life to live is gone from my life. I want ErIcka Slezak to win her 7th. And LW should never have crossed that line to do the chew. No one can come close to the talent of Erika Slezak. I know the others are very good but Erika deserves the win. She should hold the honor of receiving it the most because she is the best. YES, YES, YES Edna. YES. The most talented in daytime – Laura Wright. Crystal Chappell she so deserves it!! DAYS… Crystal Chappell…. Dr. Carly Manning! Crystal Chappell will always get my vote. She is such talent and love all in one beautiful package !! !